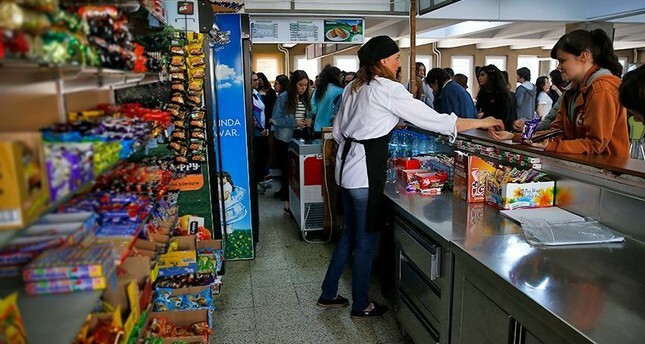 Companies that offer food products and beverages in schools will no longer be allowed to sell anything unhealthy under new restrictions which will be implemented as of the 2019-2020 academic year. The decision, which was announced Thursday, aims to encourage healthier food habits among children and fight against obesity. The Ministry of Environment and Forestry, the Ministry of Health and the Ministry of Education signed a cooperation protocol requiring foods sold at school canteens to be labeled with a special logo indicating that the product is fit for children's consumption and is government-approved. The implementation aims to prevent the consumption of foods with little nutritional value and high energy density to combat rising obesity levels. Speaking at the signing ceremony, Ziya Selçuk, the education minister, said that the logo iniative for foods will facilitate the pursuance, supervision and monitoring of all products to be sold at cafeterias, dining halls, canteens, buffets and tea houses operating in both state and private schools and institutions. Agriculture and Forestry Minister Bekir Pakdemirli said that with the new implementation the health and eating habits of more than 17 million students will be assessed and closely followed. He said that in order to control the foods entering school facilities they will use a three-colored logo resembling a traffic light on food packages, which will indicate the food's quality and healthiness. Citing that malnutrition starting from childhood forms the basis of many diseases such as obesity, orthopedic disorders, diabetes and cardiovascular diseases, Health Minister Fahrettin Koca said that necessary information has been given to children regarding their healthy eating habits.